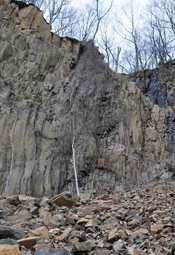 It is a sad reality that the classic mineral localities are becoming relics of the past. Many of the amazing mineral deposits across the world have closed permanently, or have been shut to collectors. Hardly any of the classic exceptional mineral deposits are still producing collectible specimens. This often happens when a mine becomes exhausted of its ores, where there remains no economic viability in keeping it open. A more acute factor behind important mines closing is that the bulk of ore production in the United States or other developed nations is shifting overseas, where labor laws are more lax and production costs significantly cheaper. This forces the closure of the mining operation, and in addition to ensuring that no new specimens are extracted, in many cases the mines are permanently filled or sealed. Ocassionally the old mine dumps provide relics of the past, but these often get picked through without any new supply. The large mining operations, such as traprock or limestone open pit quarries, are beehives of activity where mining operators often prohibit the interfering of collectors. Aside from organized field trips by clubs, and those few stealth collectors who enter illegally after hours, many of these quarries are unable to produce minerals due to collection restrictions. Though some mines allow exceptions, or their owners appreciate specimen collector value, most are clearly not interested in specimen preservation. This results in vast amounts of quality specimens ending up in the crusher. This has to do both with industrial apathy towards the collectible nature of minerals, as well as fears of insurance liability should a collector get injured and sue. Some of the famous deposits are worked solely for collectible specimens. However, access to these types of mines is generally restricted to the mine workers and staff, with occasional VIP visitors. 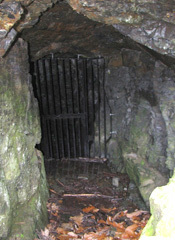 Such mines are not open to the general public. This was the case of the Sweet Home Mine in Colorado which produced the finest Rhodochrosite crystals. It was originally worked as a silver mine, and then closed down. 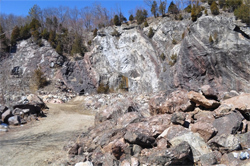 The mine was reopened by a large mineral company solely to produce the outstanding Rhodochrosite specimens. This company took sole mining rights of the mine, and it was not open to the public. Much new material on the market has been coming from developing countries. There has been a recent unprecedented surge of minerals originating out of Russia, China, and Madagascar, with new deposits continuously being discovered and worked in these places. Often, specimen mining rights are obtained by a company or individual mineral collectors who pay for the privilege to collect and sell their finds to the dealers. These end up making their way to all the major shows and flooding the market. The problem with this new material is that its mass production stifles appeal. For example, when the gorgeous Cuprites started coming out of the Rubtsovskoe Mine in Russia, these were grabbed by collectors. However, now over two years after the discovery, this material is so abundantly available, and can be found by many dealers at any given show. This mass availability indeed waters down its collectible appeal. Our hope is that public awareness will increase among mine owners worldwide so that they be more open towards specimen preservation. It is truly a shame when quarries with outstanding potential just send their treasures to the crusher, forever losing those minerals it could have produced. While some active mines do have a responsible conscientiousness, many unfortunately do not. So aside for those lucky road cut or construction discoveries, it is becoming increasingly difficult for the casual collector to find good locations to effectively dig for minerals. We have also redone the Chalcedony gemstone page with new content and links.